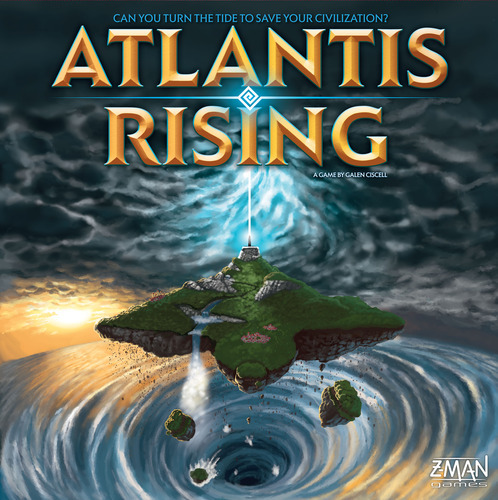 Atlantis Rising is a challenging cooperative game for 2-6 players. All players must work together to build the ten necessary machinery of the cosmic gate before the island completely sinks in this straight forward but challenging worker placement, resource management game. Each player will portray one of six Atlantean councilors each with their own special abilities. During the course of the game players will utilize their councilor special abilities; play knowledge cards; assign Atlantean workers from their supply to the obtain vital resources for building the cosmic gate machinery; and deploy workers into the Atlantean Navy to fend off the attacking Athenians. Sounds easy enough, except that at every round all players will draw and play Misfortune cards. There are a myriad of misfortunes that will plague Atlantis from flooding the island tiles, to setting off worker panic, to inflicting other maladies on the island. Additionally, any workers caught off guard on sinking island tiles will flee back to their councilor without fulfilling their assigned task. Therein lies the challenge, can you turn the tide and save your civilization? You can see a game overview in the video below. Be the first to own this game. Come and visit us at 30 NW 2nd Street in Historic Downtown Gresham. We have a full range of family games, strategy games, Euro-style games, war games, card games, dice games and more. Also for the puzzle enthusiasts we carry quality puzzles from Ravensburger, TDC, and White Mountain. We proudly serve Gresham and the greater Portland and Vancouver area.